SmugMug wants to make sure your iPhone photos are doused in a whole lot of awesome sauce. The photo-sharing site on Wednesday released Camera Awesome, an iOS camera app with advanced shooting features, plenty of editing tools and filters, and sharing capabilities. The app doesn’t stop there when it comes to high-end shooting modes: Camera Awesome offers image stabilization, slow burst, fast burst, timer, and interval modes. There’s also a Big Button mode that lets you tap anywhere on your screen to release the shutter. 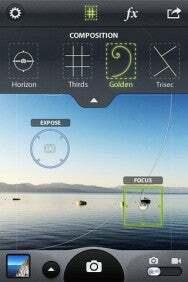 And like most other advanced camera apps, you can lock your focus and exposure separately. Camera Awesome isn’t limited to shooting still photos; you can capture videos, too. The app offers a cool Precord setting that automatically prerecords five seconds of video before you hit the record button, so you don’t miss any of the action or have a minute of boring film before the action happens. I’ve seen a lot of great all-in-one camera apps, but Camera Awesome is unique in a number of ways. First of all, the app is free. “I felt very strongly that the app should be free, which sort of sounds strange from a premium photo sharing service that doesn’t offer a free account,” SmugMug CEO Don MacAskill told Macworld. “Photography changes the world, and we figured if we could make this app free, then the world would be a better place.” While that might sound like a lofty goal for a camera app, this is the first app I’ve seen that’s offered such powerful shooting and editing tools at no cost. Camera Awesome’s true forte is in its Awesomize tool, which acts somewhat like Apple’s Enhance photo feature. Awesomize utilizes a complex photo-processing algorithm that looks for tones and colors in the image in order to make it more vibrant and, of course, awesome. 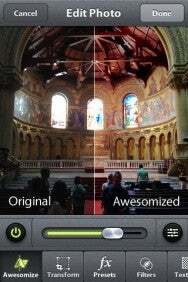 You can adjust the sharpness, temperature, vibrance, and contrast of the photo while using the Awesomize tool. 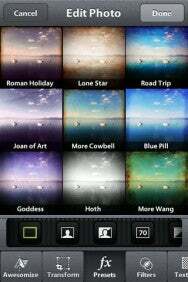 You can crop and rotate your image, or add a combination of Camera Awesome’s 261 available filters, textures, and frames. (According to MacAskill, there are 261,143 effect combinations available in the app.) Another bonus: All of the effects are full resolution, so when you apply a filter or texture, your photo will remain as sharp and high-res as the original. Once you’re finished with your photo, you can share it to a number of different sites including Facebook, Twitter, Flickr, Picasa, Photobucket, YouTube, and SmugMug. SmugMug account holders can take advantage of two exclusive features: Cloud-archiving and cross-posting. Enabling cloud-archiving automatically saves all of your photos to a private SmugMug gallery. Cross-posting authorizes SmugMug to quickly post your photo to various sites, so you don’t have to load and wait for them to post individually. Camera Awesome is available for free in the App Store; it requires and iOS device running iOS 4.3 or later.